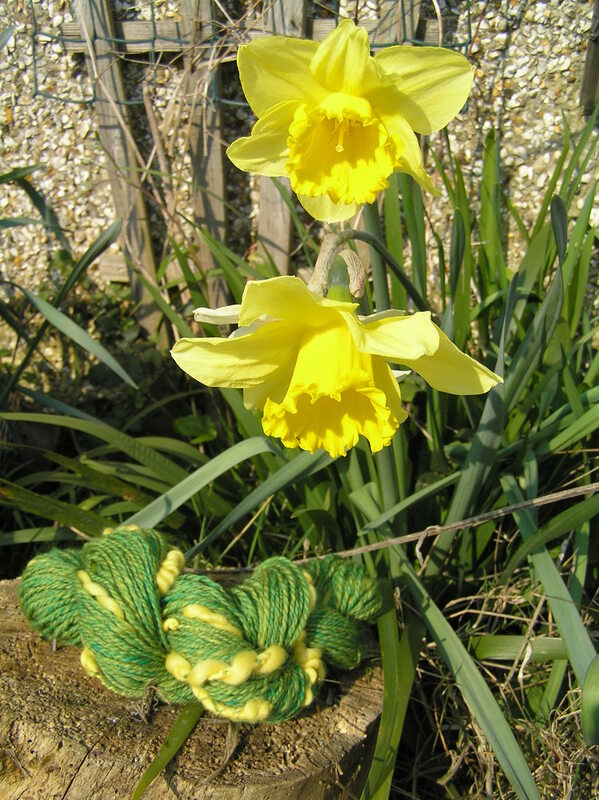 I recently entered a competition on www.handspinner.co.uk, Shiela Dixon’s (the self-titled ‘dealer in addictive substances’) site – the aim was to produce something that captured the daffodils in her photo. My entry was a first go at using thick/thin yarn with a bit of corespinning and wrapping thrown in for good measure – all things I had read about and seen elsewhere, but never had tried out myself. This was the end result – and it won!! The competition was judged by Alison Daykin of http://www.alisonyuletextiles.co.uk/, so having a professional textile designer say lovely things about my work made my day – my entry “was by far the best, almost achieving the look and feel of a daffodil”. My prize was £40 of goodies from Shiela’s shop – I’ve gone for some Power Scour and Fibre Wash for use with some fleece that should be with me soon, some dyes, silk and 3mm needles. I also ordered some superwash/nylon blend fibre from www.worldofwool.co.uk which I hope to dye and spin to make socks – I ordered plenty of it as I got nowhere near enough yardage from my recent attempt at spinning sock yarn! This entry was posted in Spinning and tagged Spinning. Bookmark the permalink.